Today, I continue the story of our Summer 2008 trip to Greece. To see all of our pictures, click here. For most of the pictures, Nik has mapped them so you can see exactly where in Greece they were taken. If you missed the other parts in the series, here’s the whole list. Our major “trip within a trip” was to Santorini. Santorini is probably the most famous of the Greek Islands. You know when you buy a calendar of Greece pictures and you see the pictures of white houses with blue roofs on the side of a cliff? Sort of like this? That’s where we went! We were also told that it’s the place to go as “honeymooners” and not with kids, so we’d better do it now! This was actually the portion of our trip designated as “our first anniversary trip.” It was a very romantic place to celebrate our first anniversary. We arrived via high speed ferry, a four-hour ride from Athens. Santorini is the caldera of a volcano that exploded a long time ago. The three main towns are positioned along the rim of the caldera so that on one side you have views of gorgeous cliffs and on the other side, gently sloping hills and farmland. The contrast is really stark, and gorgeous. (I’ll try really hard not to use too many superlatives in this post but it’s going to be hard. We were overwhelmed by beauty in our three days there!) We stayed in the town that is at the top left hand corner of the picture, at the very end of the island. We arrived in the early afternoon of our first day and arrived by bus in the town of Oia (pronounced Eee-uh). Oia is on the northwestern tip of the island and is the perfect place to watch Santorini’s sunsets. We were glad to be staying in such a beautiful little town. We didn’t rent a car until the next morning, so that day we decided to walk down to go snorkeling in the little cove that was below Oia. It was a long way down, especially with a broken toe but the snorkeling was great and well worth the hike. That night, we experienced our first sunset (our first Santorini sunset that is!). There were people everywhere and the light was incredible. The next morning, we picked up our cute little red rental car and headed out to Perissa, a black beach. Santorini has all three kinds of beaches – red, white, and black sand. First, we stopped in the little town of Pyrgos and hiked to the top of the town, where there was a small castle and a great view of the island. Perissa was beautiful with great snorkeling, but let me tell you, black sand gets blisteringly hot! After Perissa, we ate lunch (which is Greece is usually at 2-3 in the afternoon and the main meal of the day) in a family taverna in Vlyhatha. The cliffs there were really cool. Sunset #2! This time we opted for a different position in town. The first picture is looking down at Sunset #1’s position. In the morning, the buildings are blindingly white. It’s quite a contrast from the sunset light! Our second full day in Santorini was spent on the other end of the island. First, we went to the Red Beach, which perhaps wasn’t as red as I was expecting. But it was definitely red! The snorkeling at Red Beach was really great as well. 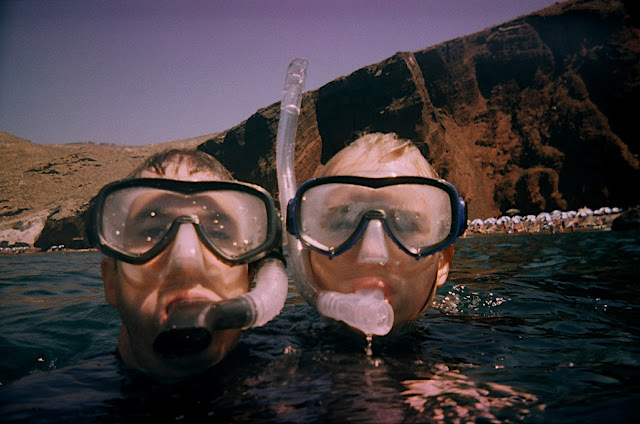 I love snorkeling – I’m not a strong swimmer and usually can’t spend much time out in the ocean. But with flippers and a snorkel, I feel like I can swim for hours. We saw so many cool fish and other sea life. That afternoon, we ate our lunch in another family taverna in Mesa Pigadia. The family specialty there was a pickled eggplant that was very good. White eggplant is a speciality grown on Santorini (along with cherry tomatoes and grapes for wine.) We also saw the owner’s family working on harvesting their own capers, which we had just eaten in our salad. Here are a couple views of the southern end of the island, including a lighthouse picture that was taken especially for you Mom! We went snorkeling from the beach all the way on the left, almost to the second point. Our final sunset in Oia, we actually watched from the back porch of our hotel room, in the company of our resident mama cat and kittens. Our final morning, we went for an early walk. Santorini has a pedestrian walk that is usually jammed full of people in the evenings. It was fun to walk there and people watch at night. In the morning, however, we almost had the whole walk to ourselves. It was just us and the resident pack of homeless dogs who liked to follow us around, hoping for food! Look closely to see our friend’s object of interest. Santorini was an incredible place, with incredible beauty. I was overwhelmed. It was unlike any place that I’d been before. We saw many other really amazing things on our trip but I think Santorini topped them all. Gotta go there some time. So beautiful! Thanks for the lighthouse! I cannot get over the beauty of Greece, both God-made and man-made. It’s hard to find words for the feelings as I sit and try to take in just these pictures – the reality must be even that much more enchanting. What a blessing to have been able to take that much time to soak in the atmosphere.